You even get a complete Credibility Book that you can customize and use as your business card! You get Private Label Rights to a step-by-step, 83-slide presentation that you can use immediately to help grow your business. This package also includes videos, reports, infographic, postcards, autoresponder messages and lead-gen website in a WordPress Theme and HTML5! The directories include: Google Places; Bing; Yahoo! ; Yelp; Merchant Circle; Yellow Pages; Supermedia; Citysearch; MapQuest; Local.com; Foursquare; LinkedIn; Angie’s List; Manta; Kudzu; BONUS! Facebook Pages. Lead-gen website in WordPress Theme and HTML5. Three professionally created lead-gen videos: USA and UK voiceovers. One with no sound. 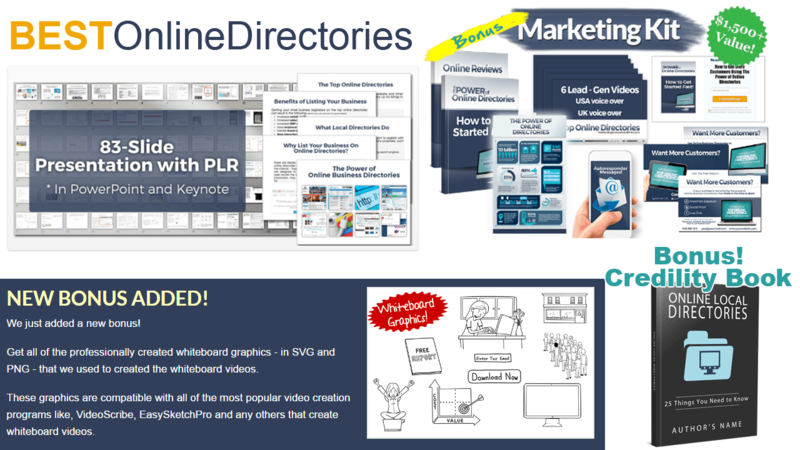 BONUS… Mega Local Whiteboard Graphics Bundle! BONUS… Credibility Book and Author Rights means you can customize, upload it to Amazon, print it and use it as your business card! This Pre-Made PLR Presentation and Marketing Kit Saves You Tons of Time and Massive Amounts of Money! As a consultant you know first hand how valuable your time is. In fact, you probably sacrifice some things so you can do others. And my guess is many of these things you sacrifice are very important to you and your business. Our products provide you with a way to save hours an hours of your time because 90%+ is already created for you.This allows you to focus on other important things. Things that you know you should be doing but haven’t been able to get to. Comes in PowerPoint and OpenOffice formats… Makes customizing, adding and changing the presentation a breeze. Step-by-step instructions provided… Saves time because you’ll know you’re doing everything right the first time! Focused on the Top 15 Directories… Saves time because you won’t spend it submitting to sites that aren’t worth it. Screenshots and images show exactly what to to… Saves time because you can see exactly what needs to be done and you’ll have confidence that you’re doing it right the first time. PLR rights to the entire presentation… You can customize it however you need to. Brand it with your business information. Add to it. Change it however you see fit!